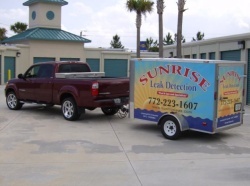 We use the latest in sonic and electronic equipment and are able to pinpoint any leak, from the smallest leak to a broken pipe under ground without any damage to your patio or yard. If you have a leak, I can assure you that Kris and I will make every effort to expedite your leak issues as fast and professionally as possible. Please feel free to contact us with any questions you may have.